I am sure this security footage gave his mother a great sense of peace. It would have been a glimmer of hope among her terrible loss. Her happiness in this image says a lot to me! 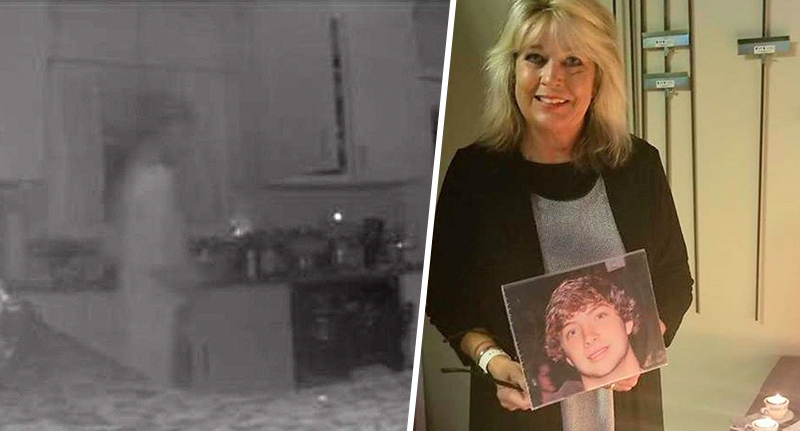 A grieving mother has claimed her son’s ghost returned to the family home after her security cameras captured a transparent figure in her kitchen. Robbie Hodge, the son of Jennifer Hodge, 57, from Atlanta, Georgia, died two years ago of an accidental drug overdose from what was thought to be fake Xanax aged just 23. The bereaved mother-of-two had spent the past two years coming to terms with the loss of her ‘caring’ son, when she received a notification on her phone reading ‘person spotted in entryway’ last week. Ms Hodges had been watching television in bed with her daughter, Lauren, 21, and nearly drifted off to sleep when her phone sent the alert. It was her entryway home security camera which had been triggered, according to the notification, at 11:51 pm on 5 January 2019. The message said the camera had ‘spotted a person’. The image sent to Ms Hodge’s phone clearly shows a transparent mass in the shape of a human figure. The mother and daughter ran to the kitchen and found nothing disturbed and no signs of a break-in. In hindsight, Ms Hodges believes her security camera in fact captured images of her son’s ‘ghost’, who had suffered from OCD, ADHD, anxiety, and addiction. The figure appeared in the kitchen and seemed to be wearing pyjamas in the exceptionally clear still capture. No doubt many will take this as proof of the existence of ghosts. Robbie was a great kid. He had an addiction and we thought for sure it had to be heroin when he passed away. But the only thing that we could track down is where he was buying Xanax. He and I together had started a charity before he died and it was to turn real estate into a way of saving lives and stopping an addiction. We’d won national and local awards for it. He used to try and help other people when he was in need of help too. "It’s just insane – I’m blown away. It’s just crazy. I was laying in bed watching TV with my daughter and I was just about asleep. I was stunned. And it did look just like him – beard and all". His mother claims he was a ‘giving, caring, loving human being’ and the pair had even set up a charity to help people battling addiction prior to his death. What an awesome experience for the mother and sister. Addiction is one of the hardest things to lose someone you love to - I am glad they could share this glimpse of him together. Without any accusations, what I immediately observed is a lack of proportions of the location vs the alleged ghost, The alleged head looks VERY oversized and scaled incorrectly to the kitchen background. Pictures in the digital age are difficult to validate and even more so with pixel level editing available in Photoshop. Without witnesses and supporting evidence the sell will be hard to swallow in any critical manner. Thanks for the share Klainey! For what it's worth, with the countless hours of paranormal investigations on various TV shows, no one has captured anything on camera close to this. Since most/all para TV shows are likely fake, or mostly fake, take that with a grain of salt, but still..the few that actually do proper investigations would make a big deal out of catching something like this. No one has even tried to fake something like this because it would likely fall apart under scrutiny. I've probably been on 50 or so investigations, and aside from some EVP's, have never captured (or seen) an full apparition. Several times when there was other activity happening at the same time I did get a few quick 'sparks' (for lack of a better word), but that's it. I work for a company that has a division that supports Nest, and AFAIK Nest is strictly video, no still photos, at least in my area. So that's suspicious. Typically folks who may have captured something will look up a paranormal group or something similar, and not go to the media. In part because they don't want to be seen as crazy, and because they are looking for real answers. This appears to be a case of wanting media attention, and perhaps even set up by the family for that reason, maybe sympathy, whatever. She was paying for video services. She stopped paying for it. Meaning there was old videos on the server and through a computer error an old video was treated as a new one. I had a similar experience it pulled an old video and showed me my mother came to the door. I called her and she said she hadn't been by at all. Turned out the video was from a year earlier. She visited for Chrismas the year before I suspect the system they use looks at the month and the day but not the year. Edited by Vlawde, 17 January 2019 - 10:17 PM. To me it looks like a more feminine shape and I’m not seeing a beard. Edited by lorac61469, 18 January 2019 - 03:20 PM. What ever the case glad the 2 women found some comfort from the picture. Thank you Dash - whatever the case maybe if this has brought comfort or peace to this family, then it's not for any of us to take it away. interesting explanation about the video being old... you'd hope she's not in on a scam and truly thinks its her son, otherwise it's a bit off colour isn't it? For what it is worth. I had picked up the mother and image is genuine. Even if the image was manipulate or the video some how was able to record old footage into new. Who can really say spirit doesn't have the means and knowhow to do it. Agreed siguie, but at the same time if it gets big coverage, it's only natural for it to be scrutinized. She has two daughters living with her doesn't she? This might explain what appears to be a nightgown. From what I can find she has 2 daughters and a son. Oh, by the way, none of us are good at photo shop. And my mom got the Nest security cam AFTER my brother passed away - so there's no way it's old footage. Nests are digital anyway, so it's impossible that it's a stain or old footage coming through. Besides, I'm pretty sure Nest would be in big trouble if their cameras sometimes showed old footage as current. Regardless - the security cam wasn't around when Robbie was alive. Trust me, I'm skeptical too! Please be respectful - this is a sensitive thing for my family. We miss and love him dearly. Robbie was such a kind-hearted, genuine, beautiful soul. ***There's many thoughts, opinions and beliefs about the validity and the meaning of all this. We don't know anything for sure, we're just sharing what happened. We're honestly in disbelief, but again we can't find a logical explanation. We don't claim a dogmatic belief that this could be only ONE thing, because we'll only know the possibilities of the afterlife (with certainty) once we ourselves pass over. However, unless we find reason to believe otherwise, I like to believe that this is a peaceful and loving visit from my angel brother to let us know he's okay and he loves us. Thanks for the info Klainey. It's not relevant but is the kitchen cupboard door slightly open? how creepy, I always worry about what is going to come up on the cam I have set up! !